These pictures are far from great, but it was the best I could do in a room where I was surrounded by journalists, TV cameras and photographers who are far more important than myself. That's what happens at the opening press conference for the Bank of America Chicago Marathon. Everyone shows up...including the mayor. 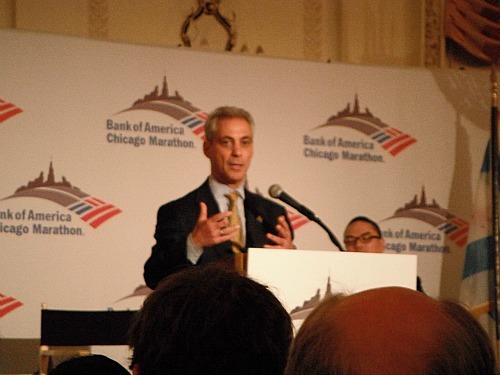 Mayor Rahm Emanuel kicks off the Bank of America Chicago Marathon press conference on Thursday, October 4. 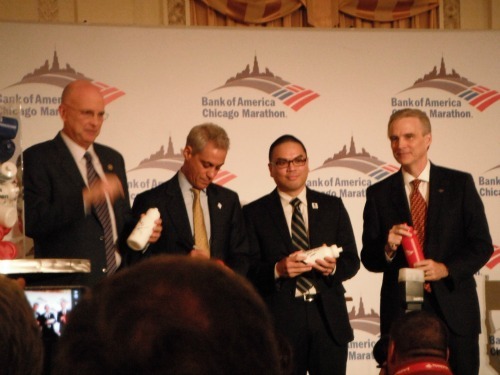 He joked that no one held an event quite like this one for his two Chicago Triathlon finishes. For every water bottle that's signed at the expo or Bank of America's 172 area locations, Bank of America will donate $1 (up to $250,000) to the Wounded Warrior Project. Executive Race Director Carey Pinkowski, Mayor Rahm Emanuel, Wounded Warrior Project representative Jason Mauricio, and Illinois president of Bank of America Tim Maloney lay their John Hancock's on water bottles to show us how it's done. 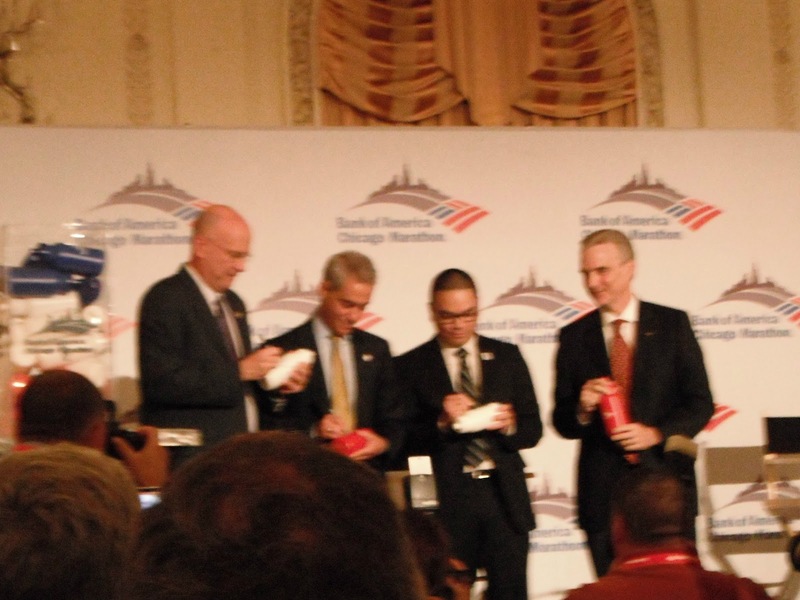 Here's the foursome again after signing their water bottles to support the troops. Steve Jones. Joan Benoit Samuelson. Paula Radcliffe. Khallid Khannouchi. Sammy Wanjiru. Liliya Shobukhova. 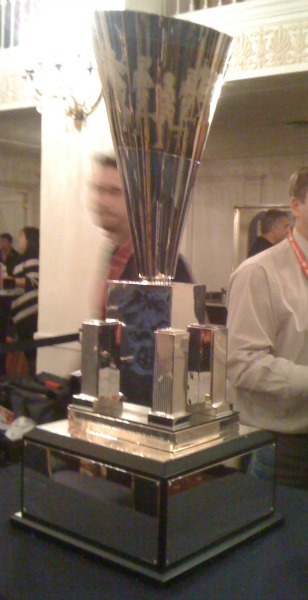 Whose names are going to be added to this champions trophy after Sunday's race? Wesley Korir? Dathan Ritzenhein? Liliya for her four-peat? This picture hardly does the group that's on the stage justice. 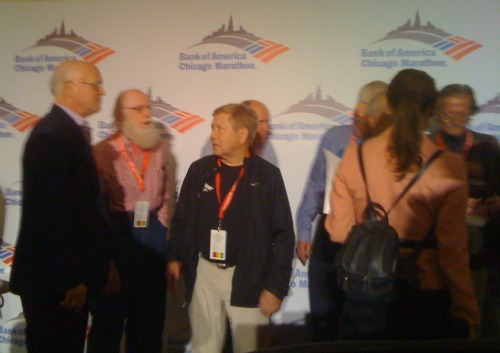 The men--those obstructed and in plain sight--are the nine who have run all 34 of the Chicago Marathons that have been run since the first in 1977. Imagine all of the miles they've logged in 35 years! What an accomplishment for Joe Antonini, Randy Burt, Henry Kozlowski, Larry Moon, George Mueller, Andrew Praxmarer, Daniel Skrzypczynski, John Tilgner and Ron Williams. What gets you fired up about the Chicago Marathon?